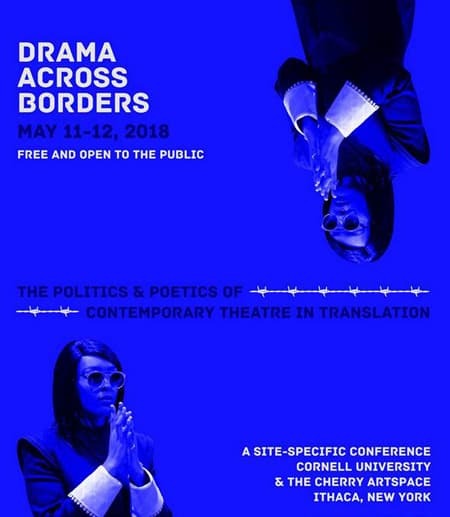 Playwrights, translators, directors, and producers from across the globe will gather in Ithaca May 11–12 for the site-specific conference “Drama Across Borders: The Politics and Poetics of Contemporary Theatre in Translation.” Panels and performances will explore how international drama expands the imagination and pushes the boundaries of political conversation. The conference begins at Cornell University’s Schwartz Center for the Performing Arts on Friday, May 11, at 6:30 p.m. with a keynote address from theatre producer Elyse Dodgson, director of the International Department at the Royal Court Theatre in London. On Saturday, May 12, the conference moves to The Cherry Artspace in downtown Ithaca. Saturday’s event, which runs from 9:30 a.m.–7:00 p.m., features presentations and performances of new works in translation from Argentina, Austria, China, Finland, France, Korea, Palestine, Poland, Romania, and Syria, among others. As part of the presentations, Sam Buggeln (Cherry Arts) and Rebekah Maggor (assistant professor, Cornell’s Department of Performing and Media Arts) will direct a number of short performances with members of The Cherry Arts Acting Company and students from Cornell University and Ithaca College. “Drama Across Borders” is made possible with support from the Translation Network at the Society for the Humanities, the University Lectures Committee, the Einaudi Center for International Studies, and an Affinito-Stewart Grant of the President's Council of Cornell Women. All events are free and open to the public. More information can be found at pma.cornell.edu/drama-across-borders. The Schwartz Center for the Performing Arts is located at 430 College Ave. in Ithaca. The Cherry Artspace is located at 102 Cherry St. in Ithaca.